A sophisticated biological strategy takes place within living organisms. Free metal ions are being stored and transported via proteins assembled into highly ordered structures such as protein cages via a reaction biomineralization. This biological strategy has gained a lot of interest among biotechnologists who believe that natural ion-storage protein cages can be employed to grow metal nanoparticles with preferred properties. Gold nanoparticles (AuNPs) are recognized for their outstanding functions in bioimaging, catalysis, therapy, and drug delivery; thus, the synthesis of AuPs with controlled shapes and sizes is very vital for their application in the field of nanomedicine. In protein scaffolds, AuNPs are produced by a sequential process involving Au deposition and agglomeration into small nanoclusters which serve as nucleation centers for the growth of AuNP. However, the dynamic mechanism behind the development of Au nanoclusters in protein environments remains vague. 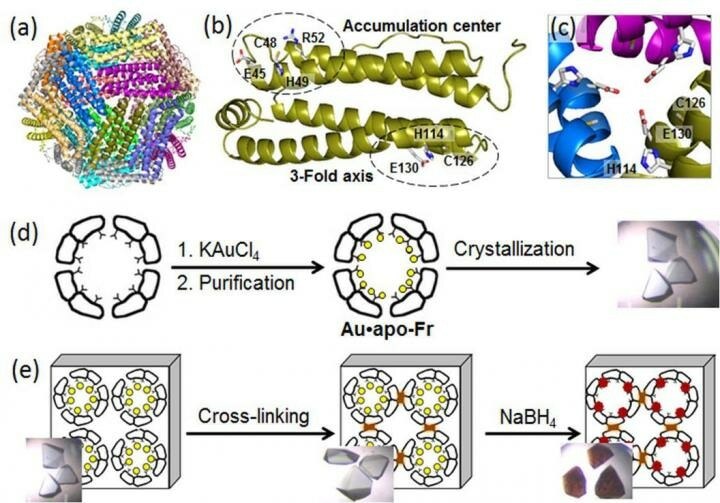 To unveil molecular processes underlying AuNP growth in protein nanocages, a team of biomolecular engineers at Tokyo Institute of Technology, headed by Takafumi Ueno, applied high-resolution crystallography and investigated the formation of Au nanoclusters in ferritin. Ferritin, a universal intracellular iron-storage protein produced by nearly all living organisms, forms a self-assembled 24-subunit nanocage with two specific metal-binding sites: the three-fold axis channel and the accumulation center (as seen in the Figure). As Au ions possess high affinity for sulfur, the researchers altered the accumulation center by adding an extra sulfur-containing cystein residue to improve Au uptake into the protein cage. Then, they toughened Au-containing ferritin crystals by cross-linking in glutaraldehyde (as seen in the Figure) to maintain their lattice structure. These alterations enabled the decrease of Au ions in the crystals and determination of binding positions of Au ions within the ferritin cage using high resolution crystallography. In the subsequent step, the immobilized Au ions were decreased into Au(0) atoms using a reducing agent (NaBH4). Consequently, the team could observe that the minimized Au agglomerated into nanoclusters developed in the three-fold symmetric channels and in the metal accumulation centers (as seen in the Figure), which was because of the gradual Au movement and conformational alterations of adjacent amino acids. The results acquired by Professor Ueno and his colleagues reveal the mechanism behind the creation of Au nanoclusters which are anticipated as nucleation centers for successive AuNP growth in the unique protein environment, offering a platform for futuristic research of biomineralization and nanoparticle synthesis in biomolecular scaffolds.